Any place of worship, irrespective of religion, radiates an aura of positivity. Such places when located amidst picturesque landscapes offer visitors an excellent opportunity to embrace the beauty of Mother Nature. 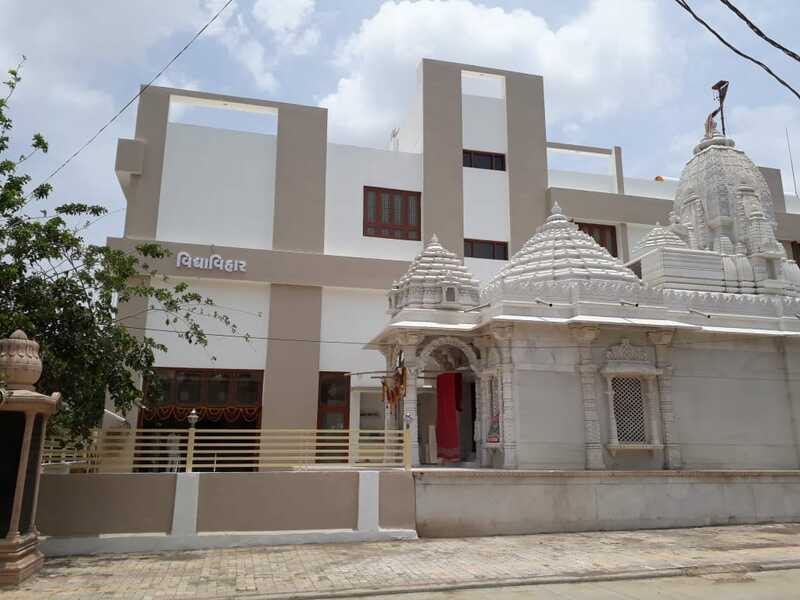 One such sweet spot is Vidya Vihaar, a Jain temple situated in Shatrunjaya hills. It resides amongst a cluster of other Jain temples in Palitana. If you have ever visited this place, you would readily agree that Palitana is the holiest pilgrimage centre for all the Jains. The first Tirthankar, Adinath, was born here. Every year a majority of Jain followers visit divine Jain temples here with immense hope and seek purity of their souls. The 4 months of monsoon (known as Chaturmaas in Jainism) in Palitana is full of saints and devotees. The temple complex in Palitana is believed to house about 3500 Shwetambar Jain temples and one Digambar Jain temple. About 900 years ago, in the 11th Century AD, the temple construction is believed to have been initiated. An epitome of Jain principles and philosophies, the VidyaVihaar temple was built by a Jain Shravak, Late Shri Kundanmalji Tarachandji with inspiration from Jain Shravika Shrimati Sakubai Kundanmalji Khidavat (Bali, Rajasthan). Be it accommodation, food or travel, there is no dearth of basic amenities in the town of Palitana. There are multiple affordable options in and around the temple complex that offer a comfortable stay to the devotees. For example, the Vidya Vihaar Trust has a wide range of A/C and non-A/C deluxe rooms with nominal tariffs. They include four, triple and double with nominal tariffs. They include four, triple and double occupancy based on the devotees’ needs. The check-in and check-out times are also quite flexible. Gujarat Tourism also has a resort here called, Gujarat Hotel Sumeru, and it is worth spending your money. Next comes the food, and taste. Palitana was the first city in the world to be declared legally vegetarian in the year 2014. This is justifiable as it’s a sacred place for Jains who are strictly vegetarian. The Dharmashalas have provisions of food along with accommodations. State transport buses also ply between Palitana and major cities of Gujarat. Apart from that, the nearest functional airports are Ahmedabad and Bhavnagar. Needless to say, Jainism is one of the most ancient and revered religions of the world. The root dates back to 6th century B.C. and was founded by Mahavira, an ascetic. It emphasizes meditation, the sanctity of life and non-violence, maintaining a basic life principal in all objects. The adherents aim to attain identity through ascetic practices. Some of the temples have small windows and each of them houses a small idol of one of the 24 Jain Tirthankars. Any normal day at the temple witnesses multiple rituals scheduled throughout the day. The morning serviceis started at 6.30 AM. The priest purifies his material body (i.e. hands, feet and mouth), and opens the temple. After entering the designated sacred hall, he utters ‘nissahi’ or ‘nissarahi’, indicating that he has left all his worldly desires behind. Thereafter, the temple and the idols are cleaned thoroughly by him. A lamp occupies the right side of the idol of the Tirthankara and the left side by a container for incense. Further, the nine limbs of the Tirthankara are smeared with ‘Vasa’ powder, which is an aromatic paste consisting of elements like sandal, camphor, ambergris, musk and saffron. After other subsequent rituals, the ceremony concludes with the priest returning to the material world after ringing the ‘bell of victory’ and speaks the holy words – ‘ivissahi’. There is another service at 10 AM. The priest prepares ‘Panchamrit’ and pours it over the idol. Subsequently, the nine limbs of the idol are smeared with sandal while reciting prayers. And the evening service is a normal one with the sequence of rituals being repeated with minor variations. It is held between 5 PM to 6 PM. Palitana is indeed worth visiting from religious as well as tourism’s perspectives. The soothing atmosphere there will leave you spellbound! Do take some time out from your hectic schedules and embark on an enthralling and spiritual pilgrimage.